We just had new granite kitchen countertops installed, using a high-movement stone with lots of veins and embedded crystals. The sample we picked was smooth as glass in the showroom (picture attached). But our countertops will snag paper towels when wiping and I can feel the transitions from the main material to some of the veins with my fingernails. I asked the installer about this, and first he told me that's just how this particular granite is. When I pressed him on the store sample being different, he said it could be some kind of epoxy residue from the factory (?) and took a razor blade to scrape the counter, which did scrape off some kind of whitish material (and also left a light scratch in one area). Then he said it still needed to be sealed, and put on sealer and told us not to mess with it for 8 hours. It's been 6 hours now, and the countertop surface feels kind of "plastic" when touching, but it's still not smooth everywhere. I feel cheated - are we being blown off by this guy? The shiny smooth surface of the granite slab you saw in the showroom is exactly how a properly polished granite countertop should be. And just FYI... no chemical or sealer makes the countertop smooth or shiny. The "polish" comes from intense friction and abrasion on big machines at the factory. A granite sealer will ONLY slow down the rate of absorption to help prevent staining. For some reason many stone salespeople and installers are misinformed and think applying a granite sealer solves nearly any problem you may encounter. make it seem like he was solving a problem. What's worse is that he doesn't seem to know how to properly apply a sealer. You don't leave it on for hours. In fact, a granite sealer should not be left on the surface for more than 10 minutes in most cases and then wiped completely dry. And 10 minutes is a really long time. Most often the sealer only needs to dwell for 2-5 minutes. Thus, in addition to the existing issues you probably now have granite sealer stuck to the countertop surface... it should only be below the surface in the pores. Most likely what occurred is that you picked out a color via the sample and then the installer purchased a cheap low-grade version of that granite variety. Something could be on the surface... what that may be I have no clue. A resin is often legitimately used to fill voids, etc., but it is applied prior to polishing and absorbs into the pores... does not sit on the surface. The long and short is that you should have got the exact slab you picked out at the warehouse. Picking out the exact granite slab that you wan to install is the only acceptable way to purchase granite or any stone. Because granite and natural stone are "natural" products meaning there isn't any strict consistency from one slab to the next even among the same colors. Now most slabs of the same color will be similar, but you can certainly get an extreme difference in characteristics and quality. And if you entrusted your installer to pick out the slab, then at least you can hold him accountable to the fact that you chose a sample that was perfectly polished and that is what you expected. Pitted granite top and smooth edges! Looked at several places before selecting slab granite for kitchen countertops. Nice installation however top is not smooth but pitted and the side(s) are smooth as silk. What is wrong here? Thanks for your insight. The edges are freshly cut and polished for your installation. However, the slab itself was cut a long time ago along the plane that is the top surface. It was polished a long time ago too. Then the slab was transported from overseas, moved around a warehouse, and finally cut to your countertop dimensions. So, the top surface has had a lot of time to develop some pits where the edges have not. Also, the top will naturally get more pits as it receives more use and impacts, etc. Plus, it is a much larger area than the edges so the chance of getting a pit is greater. I purchased 60 sq. ft. of granite from a "premium product supplier". It was a level E granite. Within 13 days of installation, a fissure appeared across an entire slab (which was used on two sides of the kitchen). That fissure absolutely was not present at the time I selected the slab or at the time of installation. After a lengthy song and dance (including a warranty claim), it turns out that the slab was "filled at the quarry" - i.e., a fissure was filled in. I don't have any issues with that, it's the transient nature of the repair. I have been told by several granite companies that this is standard practice these days, but no one could explain why the fill has begun to disappear other than one person who said that it was done one the cheap (the supplier for the record indicated that they are not in the practice of filling fissures, but then denied the warranty due to the fissure being natural- having entirely ignored the fill issue). I have also been told that my granite is a super premium type of granite and thus fragile. Who in the world knew that? I have been advised to buy A or B level granite "next time" as those are much more durable. Well, I have 6k worth of expensive granite less than 6 months old that is pitting because it has been exposed to water from drip drying dishes on a cloth (as I did for 20 years with laminate). Was granite not supposed to be the most durable material available??? I now wish I had just had a stainless steel counter installed- commercial kitchens use and abuse them for decades with no fancy cleaners or maintenance. Is glue a fix for rough granite? My new bath granite counter is very rough, with one large flake off that isn't readily visible but can be felt, and lots of pitting. The company sent a guy to fix it. He's using a bottle of glue, some acetone, and a quick dry for glue. Then he buffs it. Is adding glue to the pits a way to fix a new counter?? The front edge is smooth as a baby's bottom. So much for him saying this style of granite comes this way. Pits can be filled with acrylic, but simply applying some type of glue over a larger area that is rough is not really a fix at all. The countertop should be smooth like the edges. If it is rough it needs to be refinished to a polished shine. But, nearly all granite slabs are polished at the factory so if your has rough patches it may be that the slab is of inferior quality and simply cannot be polished well... at least not in that spot. But again, chips can be repaired with epoxy and pits filled with epoxy or acrylic, etc. A rough patch needs re-polishing, though, is often not curable. We recently bought a house and redid the kitchen. We went to a local granite place and picked out our two slabs needed (snowfall if anyone wants to google it--it's white with black/brown veins). To be honest although I have had granite (it was installed before we purchased it) before I've never actually picked out a slab--so it never occurred to me to actually rub my hands over the entire slab. Within the first few days of using the counter I noticed some rough areas and a few small pits here and there. At first I thought the "roughness" of the counters over some veins was interesting and actually cool. (As in it gave it some character). But then I began to wonder if it meant we paid top dollar for something not finished correctly. In any case, I emailed our sales rep who said she would send out someone to buff and polish it for us and it should take care of it. After reading some of these posts I am wondering if it will even help? There isn't anything horrible in the countertop-- again a few pits and rough veins (nothing that would cut anyone, snag a rag etc). My concern is will it get worse as it ages--right now we have only lived here for a few weeks--but we expect to be here for years. So, do you think the professional "buff and polish" will help? And if not, are how the counters are now how they will stay or will the roughness just get worse over time? Thanks so much! Additional polishing may help, but often it cannot improve it. The slab was polished on a big specialized machine so if it came out with rough areas and veins then it is likely a sub-par slab. Hopefully, it will help and maybe completely solve the problem, but I wouldn't hold my breath. Hard to say if it will get worse. It won't spread it that is what you are worried about but the rough areas may not hold up as well with use and you could see some more deterioration over time. But again, it may not. 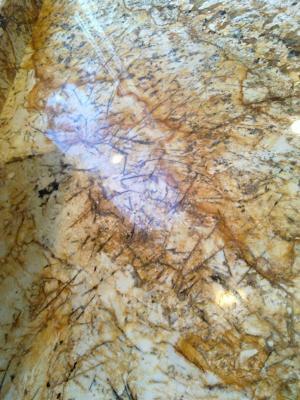 We had a countertop installed with a granite called "Golden Wave". In some areas the veins or fissures are easily discernible and can be felt as small pits. I always thought that because we knew the installer personally and that the job was "at cost" and highly discounted that the finish may not have been as good as it could have been. Since then I have seen some information indicating that these fissures are natural characteristics and no amount of polishing can remove them all. Though I am extremely happy with the outcome I would like to know the real story. Did the installer/fabricator save money on the grade of polish or are these "pits" normal? The fabricator likely saved money as this slab may have been cheaper if the fissures are dramatic. Sometimes a slab like that has less appeal for many. However, fissures and veins are normal and often you can feel a slight depression along the course of the fissure. It's only if the fissure feels rough or there are many actual pits in the surface does that indicate a low-grade slab. Previously wrote about tons of pits and several fractures (fissures if you ask the installers). They sent a repairman who filled the larger divots to my satisfaction. My primary concern with the fissures/fractures was "reinforcing rod blow out". Repairman informed me the rod is fiberglass so blow out isn't a concern. I double checked and confirmed that is a thing, i.e. using fiberglass that isn't prone to rust. We are at the tail end of a kitchen remodel that has dragged on for 5 months and has been a constant battle with multiple contractors for repairs and corrections to work that wasn't done right the first time. Knowing a counter replacement would be a horrible uphill battle and accepting my own responsibility for failing to research well enough and pick out my exact stone, I've decided to capitulate. The countertop looks good (except for the fractures) as long as you don't scrutinize it for flaws and the flaws should not affect long-term durability to the best of my knowledge. If it does deteriorate, I'll fight the battle at that time with the 15-year warranty waving furiously under their nose. Tons of tiny pits and stress fractures? Just had granite installed a couple of days ago. There are hundreds of tiny pits all over. Mostly concentrated in the darker areas of the stone. They are only visible when looking with bright indirect light at about a 30 degree angle. They can all be felt with fingertips. There are larger faults in most places where the metallic flakes are at the surface. Two of those areas have significant divots in the surface. ~3mm diameter and ~1-2mm deep. The section of counter adjacent to the sink cut out has 4 or 5 squiggly lines that run 10 - 12 inches inward from outer edge. These can also be felt with finger tips and I'm guessing are stress fractures. I'm just not sure if they were there before or after install since we didn't pick out the exact slab, just the color. I can probably live with the pitting and maybe even accept filling in the divots with epoxy or some such. But I'm seriously worried about the possibility of stress fractures near the sink. I've got some pretty good pictures to illustrate, just not sure of best way to make them visible to folks in this forum... I'd rather not post them on facebook or some such because I don't want to push my wife into discontentment until I have a handle on the situation. Either finding out it isn't a problem or having a solution ready to go if it is a problem. Granite can pit, but you don't want to install a new granite countertop that already has pitting over most of the surface. The squiggly lines could be veins which are weaker spots but may not cause a problem. Or they could be hairline fractures. One fracture that doesn't have a lip usually is not a problem, but having several particularly around the sink cutout (weakest area and with heaviest use) is not good. All around sounds like a bad slab. Since the installer picked it out, then these issues are on him. He probably tried to increase profit by buying a cheap blemished slab. Needs to be replaced with a quality slab. The granite store (very reputable in area) said that my only options are to have the fabricator fix only the edges of the etched countertops or charge me $5,000 to take the granite out because he can't resell it. What are my rights? Can't give "legal" advice but you paid for a correctly fabricated (smooth, shiny, undamaged) piece of granite so it doesn't matter if the store or installer can sell it again. It was their mistake not yours and should repolish all of it. Better to do it in place because removing it could damage cabinets, etc. We just had granite countertops installed and the entire surface is covered with cracks and scratches - glossy from a distance, but if you're close and look at it under light it looks bad. Our contractor said that's simply how granite looks. ALL granite. Now I'm skeptical - and we paid top dollar. The pattern of granite can look different depending on the angle of view. Looking down it may look smooth and shiny. Look from the side and suddenly a bunch of seemingly dulls spots, lines, veins appear. The minerals all reflect differently and this odd visual effect is normal for granite. It's unlikely that there are cracks all over or scratches all over. Could be a crack here or there but you'll see that more clearly looking down or from any angle really. If the countertop is smooth and even to the touch all over but only seems to have blemishes when looking at a low angle... then that is normal. Thanks for referring me to a previous answer. Our granite was picked by builder and question is should he replace it for the quality stone we were lead to believe we were getting? If the granite picked by the builder has problems or is unsatisfactory, then the builder should replace it. I purchased a condo w/ granite countertops - they are not smooth and have many rough spots - at first I thought the prior tenants abused it, didn't use a cutting board etc. After reading this column it seems pretty clear the owner chose to install a cheap grade of granite without proper polishing - cheapest solution like all his other choices! I would not recommend granite - I'd recommend quartz. The quartz frequently installed in rehab buildings is smooth and beautiful. Just had my Fantasy Brown installed and when I walked into house I could see all the marks on my island. Owner came out and I guess the standard answer seems to be "it is normal cause it is natural Stone". I was also told the abrasive looking marks are also normal on high end granite and it happens at the factory when the polisher hits different minerals in the stone. I can't believe this but also don't know enough so would welcome your knowledge and comments. It is common for people to think something is on the granite or that it is not polished correctly when what they are really seeing is the pattern of the granite which can look spotty when viewed from a lower angle. Light reflects differently off the different minerals. You don't see this looking straight down but at an angle or in certain light it is visible and normal. Now, I don't know if that is the case here. It may be that you have some evidence of poor polishing or a bad slab. Hard to say without looking at it in person. I'd recommend having a different fabricator or a stone restoration pro take a look. I have had my granite countertops for a few years. Some of the veins feel rough and not smooth like the others. I did not notice these when it was first installed. What could have caused it and what is my remedy? Veins or fissures in granite are weak spots, however, they normally polish to a smooth shine like the rest of the surface. Very unlikely that they were polished and smooth and have become rough. Granite is so hard that not much can wear it down. Have a stone restoration or stone fabricator assess the issue. We just had Alaskan white granite installed. When we went to look at our slab, we noticed a rust looking spot and said we DID NOT want that spot on our counters. We were assured that it would be cut out as waste. After installation low and behold there is that spot. I think it's rust and we are going to try and lift it out with a granite stain remover. The company we bought it from is also going to "look into it" but now I'm seeing these little yellowish-green spots on granite. Very faint, but there. Is this normal, and if so what is it? To remove rust stains use this Rust Stain Remover for Marble & Granite. It could be just a weird anomaly in the composition of the granite. It's not at all uncommon for a particular granite color to have a relatively consistent pattern and color and then also have a patch or stripe of a different color not see anywhere else in the slab. If this is the case, then obviously it cannot be removed. But as you had requested, such anomalies are usually cut out. If it is rust, the above product is your best bet. But note that rust stains can be extremely difficult to remove even with multiple applications of the Rust Stain Remover. If the stain is too old or too deep, it is permanent. The yellow-green spots are most likely glue stains. This can occur when an activator or accelerant is added to the adhesive used to secure the granite to the cabinets during installation. The activator can react with some stones causing a greenish stain on the surface of the granite. It's called a "green bloom". Usually, these stains occur along the edges, around sink and cooktop cutouts, or as a definitive pattern across the surface (like circles evenly spaced). Installation adhesive stains will sometimes go away on their own, but sometimes can be permanent. Most often you'll need to remove them with a specialized process using the Green Bloom Glue Stain Remover. I am very frustrated right now, as in the letter about rough granite install, I too have the same problem, they say they will take back the one counter and then fill in the problem areas on the other, I am refusing that, I feel the company needs to remove the two counters and install a new slab, what do you think? Should I allow them to fill the installed counter, or remove it? Certainly it will be better to have new slabs that do not have any issues. Sometimes these rough or unresined slabs get through to the marketplace, however, it is my opinion that it is the designer's or installer's responsibility to warn the homeowner of any unnoticed defects in the chosen slab. In other words, the fabricator / installer should have recognized that this slab was not of adequate quality and alerted you to choose different slabs. But technically, if you chose it, it was your decision. Sometimes homeowners are not savvy enough to see or recognize possible defects. However, if you simply picked out the stone based on a sample in a showroom, then it is the installer that chose the slab and should definitely be held responsible. You were expecting a smooth slab with a quality polish and that is what you should get. All these comments relate and we too have these issues... Just too bad we all didn't know about it when choosing our slabs. My kitchen was done with two separate slabs, due to a mistake made by the installers (cut the sink hole backwards). The first two pieces installed are not completely smooth... you can feel all the lines, crystals, etc. when rubbing your hand or a rag across it. The last piece installed (from the second slab) is as smooth as glass. It seems to me that they simply didn't buff/polish/whatever they do to the slab enough on the first slab. Is that accurate? Usually, the reason a granite countertop is continuously gritty is because it needed to be resined, but was not. Not much you can do except apply a resin or other topical coating. Permanent topical coatings are not typically recommended since they can change the look and then you need to maintain the coating. But if you can find someone to apply a resin like done at the factory, then you may have a solution (although it may change the color slightly). A countertop that is simply rough in spots is likely a slab that just could not be polished very well. Some granite countertop slabs can be polished to a higher shine than others and some stone just can't be polished very well. Re-polishing at this point won't likely do it better than was achieved by the big machines at the factory. Your fabricator lost money on the error with the sink cutout and probably chose the cheapest slab he could find in the same color. Cheap because it was not the best quality. I built my home almost 2 years ago. We chose granite countertops and found out later the original one for kitchen broke and the installer over nighted a new one. I informed him when I was cleaning it my microfiber towel kept sticking, he said it needed to be sealed. He came and sealed it with a spray, didn't work at all. So my husband called him again, he came out and said he didn't know what the problem was and he would check with the company he purchased it from. We never heard from him again. Should I have him replace the entire kitchen countertops because the problem is getting worse? It's rough and cracking all over. Is it too late for him to replace it? Well, it is not too late to replace it. The real risk is in removing it and potentially damaging adjacent slabs in the process. Sounds like an inferior grade of granite that could not be polished smooth in this one area. This is not common, but it does happen. Some granite will polish to a higher shine than others and some slabs are of such poor quality they can hardly be polished at all and are not suitable for kitchen countertops. Others in the middle can be polished, but not well or with rough spots. Typically, there is not remedy. If the huge specialized machines at the factory could not finish the surface smooth, then polishing by hand tools is unlikely to be successful. We bought a 12 year old house. Everyday I felt sand or grit on the granite counter tops. At first I thought we spilled salt but when it happened all over the kitchen I became suspicious. Should I seal it? The directions say it should be wiped on and then excess wiped off. A sandy or gritty granite countertop is not an issue that a sealer can solve. Some slabs are poor quality and lack surface integrity. If these countertops are 12 years old... not likely to solve the issue. This is normal in the sense that some granite slabs will be like this, but they should never be installed. Search "gritty granite" in the search box at the top of the page or on the Questions page and you'll find a few articles addressing this issue. I just had my house built and went with my son to pick out the granite for my entire house (kitchen, baths). I picked a Grade 4 granite (the same throughout the house). The granite was purchased from a large granite place in AZ but was finished, cut and installed in a different part of AZ. I noticed many grainy dips in the finished and installed granite as well as pock marks. I was told that that is the nature of this granite. I have had granite before and never had anything like this anywhere in my finished granite before. Is what the installer told us a true fact or is it just an excuse for a lousy job? Yes, granite can come in several different grades. It is supposed to be representative of the relative quality of the stone for ornamental purposes like countertops, monuments, etc. Problem is that it depends on who is doing the grading and the criteria for each grade. A grade "1" or "A" may be the best or worst. However, often the "grades" are just different price levels. Not based on quality, but only because it is more rare or carries a higher production cost. So, there really isn't a universally accepted system, and most stone warehouses don't bother with it. Poor quality slabs are generally avoided when purchased at the quarry since no customer wants a poorly polished, pocked or heavily fissured countertop. Some varieties are more prone to poor quality slabs or a wider range of quality. So, in that sense he was telling the truth. Bad slabs still make it into the marketplace and unscrupulous warehouses and fabricators will try to pass them off on unsuspecting customers as "normal" somehow, when they know very well that a problematic slab with a poor surface finish, rough patches, excessive pitting, fissures, etc. simply should not be installed. Who is going to be happy with such a countertop? Very frustrating. If you just picked from a sample and "grade" level and then the fabricator picked the slabs... then you have a solid complaint. If you picked out the exact slabs, then it falls largely on your shoulders, except when a fabricator notices that the slab is crap, he should say something.... like you need to pick another. If he doesn't, then I say you still have a valid gripe because this is a big deal. It is very difficult and usually impossible to really improve the finish of a poor quality slab. If it could be finished to a uniform, smooth gloss, then it already would be. Thank you for the insight. The info was "right on" and helped me to understand quality differences in Granite counters. My only regret is that I didn't do my own personal research on granite counter tops and find your website before I invested $1800.00 in a counter top. I relied on the expertise of both the warehouse and the fabricator, whom I ask, if this was a good quality stone and if it would buff up nicely. Both of them told me this was a great stone and would shine up really nice. It wasn't until after I had made my deposit and the stone was installed and I complained about the blotchy spots that I was informed that I picked a bad piece of granite. I will say the fabricator did come back and pick up the granite countertop and try to buff it out, which helped a little, but not much. Again, thank you for you assistance. I just had a granite counter top installed (Juprana Saint Cecilia color) on my kitchen counters and the finish appears dull in spots as though it has water spots all over it. The owner of the company came out to inspect it and he said that was the nature of the stone. He attempted to clean it with some type of granite cleaner but it did not help. The granite countertop does not have a consistent shine like the ones you see in the store displays. I personally went to the factory to pick the stone myself and I'm sure he used my stone. Is this common that a certain stone will not have a consist shine. The granite looks awful with the dull water spots. I don't know how long it takes to cut, finish and polish a stone but this company did it all in one day. ===== Admin Comment: Yes some stones will take a shine better or achieve a higher gloss than others. And sometimes a stone will have an uneven shine (but these should not be sold or installed). I'm sure you've read how each granite countertop slab is unique in pattern/color. Well, the same applies to physical characteristics of the stone. There is significant variance among all natural stone in many ways. The quality of the granite countertop slab is key. A poor quality slab will not take a shine well. So, in a sense the fabricator is correct... it's the nature of the stone. Is it common? No, because any true pro in the industry will not buy poor quality granite slabs and any reputable company will not install an obviously inferior slab. They slip through for a number of reasons, but someone should have informed you of its condition. Gritty surfaces and spotting polishing does occur more often with Santa Cecilia granite. It's a popular stone, however, with a wide range in color and quality. You say you picked it out and are sure it's the same. Well, then you don't have much recourse. The possibility that the surface was damaged in this way during fabrication and installation is near zero. If, however, you had simply picked out a color from a sample or picked a granite slab and this one is not it... then you have every right to complain. No stone warehouse wants bad slabs and shady dealers will pawn them off if they can. Also, some fabricators will quote a cheap price, but the only way to make money is to buy a super cheap slab, which often is very low quality and then make excuses. It's a bummer, but most likely this stone cannot be improved. The installer didn't polish the countertop entirely... only the edges. The countertop surface was polished on a industrial machine at the "factory". So, it is probably polished about as good as it can get already. Maybe get a granite countertop restoration pro to take a look, but I wouldn't get your hopes up I'm sorry to say. Recently had installed a White Alaska granite countertop and felt some ruffles in isolated spots. The salesman explained that the fissures (?) can be a little ruff to the touch. Yes and (mostly) no.... fissures can be seen of course and are a normal feature of natural stone that typically do not cause any problem. In some cases it is possible that a fissure in a granite countertop could be felt as a slight ruffle in the surface. But in most cases no... the surface over the fissure will be just as smooth as the entire countertop surface. If so, there really isn't anything that can be done about it. The stone was originally finished on a huge specialized machine, so not likely to improve it. Also, the fissure probably creates more of a dip than a ridge. We recently had granite installed. It is a level 2 Fashion Gold and beautiful, but, it has lots of veins and many of them can be felt, especially with the fingernail. The guy came out and said that was normal. I'm still concerned. Should I be? Yes, sometimes you can feel the natural fissures, but the surface should be essentially flat and smooth. I wouldn't worry about it. Some follow up - you were right about the sealer, it was left on way too long and that is what is causing the "sandy" feel of the surface. I tried polishing it off with steel wool in one spot, and that helps, but its way too much work to do myself. The granite material is called "Mascarello". From what I've learned this material is prone to breaking, and needs to be filled in with epoxy to hold it together in the polishing process. However, the places were it was filled are really obvious (and in some places it has remaining chips), so I still agree with your assessment that I got a cheap/poor-quality slab (which was indeed picked by the installer).